Conservative—this is the word that usually comes to mind when describing Toyota’s erstwhile sedan, the Corolla. Since its humble beginnings in 1966, the Corolla has evolved into a more dynamic and sophisticated compact that somehow still manages to cater to the Everyman. Case in point is the latest iteration, which has just been unveiled. The 12th-generation Corolla, particularly in sedan guise, now boasts a more striking fascia. 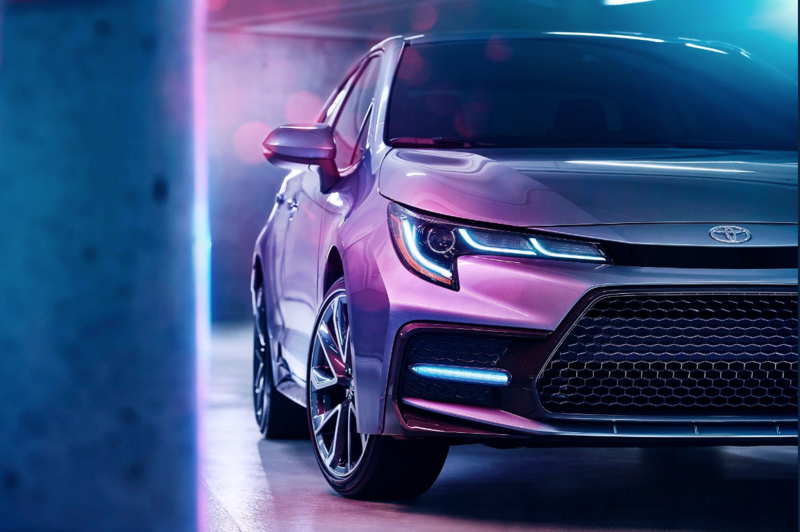 The slim headlights flanking an equally thin grille complement an inverted lower opening that seems to have been taken straight from the 86 sports car. It not only gives the car presence but a more youthful vibe as well. The side profile, while still taking its cue from the current car, is more striking with lines and creases that break up the otherwise slab look. The rear is likewise more robust and lends an air of youthfulness to the overall design. Stepping into the cabin reveals a more upscale demeanor with the highlight being the standard 7-inch touchscreen that now sits atop the dash. Higher-end trims get an 8-inch unit with Apple CarPlay connectivity and Wi-Fi hotspot. The driver also benefits from a 4.2-inch info screen that gives him or her all pertinent driving data. This can be upgraded to a 7-inch screen in higher trim levels. In keeping with its more dynamic look, the engine choices have been given a boost by a new 2.0-liter four-cylinder that makes 169hp. This is mated to either a 6-speed manual or a Continuously Variable Transmission with 10 preset “gears” when put in Sport Mode. Choose the manual, however, and you loose out on safety goodies like adaptive cruise control and lane centering assist. More conservative drivers can opt for the 1.8-liter, 139hp motor with a CVT. All 2020 Corollas will come with pre-collision warning, lane keep assist, and automatic high beam assist. Yes, it may be a bit sportier now but Corolla is still largely meant for the everyday motorist. With 12 generations and some 46 million owners behind it, the Toyota Corolla seems to be ready to break out of its comfort zone and change into bolder clothes. Expect to see it hit dealerships early next year.